I went to the lake to do a few things my sailboat on Sunday. I managed to finish the few jobs that I had and although there wasn't much wind I headed out for a sail before heading home. There was just enough wind to get me moving but that was better than not going out at all. As I sailed the wind started picking up and up. The next thing I know I'm sailing a pretty steady 4 knots or so, peaking over 5 a few times. I sailed down the lake a few miles then turned around to beat it back home. I had the lake to myself other than a couple of fishing boats. The wind was holding steady and I was having a great time. As I looked ahead I saw that something was wrong with my headsail. It was starting to bag. Badly. I realized the the halyard on the CDI furler must have loosened. No one to blame but me. I don't know what knot I tied but it wasn't good enough. I really have to practice my knot tying! I was still making pretty good time so I was reluctant to heave to to see what the problem was. I didn't have that much further to the marina. It's like when your underwear starts slipping when you're walking down a busy street. You can't just stop to reach in your pants to pull it up. But by the time it's completely past your arse and is piling up in the crotch of you pants you start to wish that you had stopped to take care of this problem. Not that this has ever happened to me! I finally gave up, furled up my headsail, and tried to sail home with my main only. I wasn't making much headway so I dropped that too and motored back to the marina. It was there, much to my dismay, that I discovered that the halyard had come undone at the top! Crap! I went to the Yacht Club garage to get my "The Thrifty Sailor Halyard Retriever" that I had donated for anyone to use. It is an extendable pole for raking snow off your roof with an old wire style potato masher attached to the end. It works well with regular halyards but the CDI internal halyard is much smaller and would not catch. I tried electrical tape wound around it sticky side out, standing on my tippy toes, I even had my tongue out but nothing worked. I packed up for the night deciding to come back the next day with help to lay down my mast. I headed out the next day with my friend Buzz to help me. Before we went I had talked to an old fisherman "Wise Old Walter". He told me to try taping a fish hook to the end of my retriever. In these parts it's hard to beat a red & white so that's what we went with. I'm 6 ft tall but Buzz is a bit taller so he worked the rig this time. After some bobbin' and weavin' and laughing it worked! He snagged it. We put the headsail back on, tied with a modified bowline knot, and went for a great evening sail. I don't know how Wise Old Walter knew this trick but I'm glad that he did. Maybe that's how old fisherman hold up their underwear. I love sailing. I sail a lot. I'm still working full time although not full days. My sailboat is in the water at my yacht club tied to a dock in the marina. It takes me 50 minutes to get to the marina and in 10 minutes my sails are up and I'm sailing. Last year's sailing season was from May 25 through to September 29. Take out 2 weeks of gale force winds in July, 2 weekends out of province on holidays in August, not a breath of wind days, rain days, various other commitments and I still squeezed in 29 different days on the water. I have made sailing a priority. I believe that it is good for my physical and mental health and good for my soul. It makes me happy. In the prairies, where I live, the wind and weather can be very changeable very quickly so when good weather presents good sailing conditions I try to be ready. I watch the weather forecasts, wind forecasts I feel the wind on my face and I watch the trees. I can be on the road quickly because I have prepared. I have a backpack ready with flashlight, batteries, cell phone cable & charger, toothpaste & toothbrush. Whatever I need to take back to the boat from the last trip such as washed drink glasses or water jugs I have ready as well. I was caught off guard by a thunder storm last year. In this video my marina is to the far right of the far shore right where this storm was blowing through. I waited it out and later, after I thought it had past, I made a run for it. I was close to being caught in the middle of it again. Now I keep a can of soup or stew on the boat in case I need to stay out on the lake or pull up to shore overnight instead of risking heading for home. I also keep a wee bottle of dark rum aboard for medicinal use only. Once in a while I'll remember something I forget part way out of town but this is why I am trying to keep the boat and my backpack stocked. Many people tell me that they would like to go for a sail but it's hard to plan ahead because of the weather. This year I'm going to keep a list people that have shown an interest in sailing and give them a call when I think I'm heading out. Today is March 4. In another 12 weeks I should have my sailboat back in the water. I better check my bag. Design Category A ~ 'OCEAN' Designed for extended voyages where conditions may exceed winds of Beaufort F8 and significant wave heights of 4m and above, and for which vessels must be largely self-sufficient. Design Category B ~ 'OFFSHORE' Designed for offshore voyages where conditions up to, and including winds of wind force 8 and significant wave heights up to, and including 4m may be experienced. Design Category C ~ 'INSHORE' Designed for sailing in coastal waters, large bays, estuaries, lakes and rivers where conditions up to and wind force 6 and significant wave heights up to, and including 2m may be experienced. I am definitely a "Category D ~Sheltered Waters" sailor although I would like to work up to some "Inshore" sailing some day. Not that I'm looking for 2m waves but it would be fun to explore some bigger lakes. The North Channel of Lake Huron, in Ontario, is reported to be the best fresh water cruising in the world. Over the past year I have made many Internet sailing friends. I don't feel that we are in competition with each as we all are so different. One thing that I've learned through this sport is that sailors help sailors. cygnus3.com Mark Roope and his family who sold everything in England, bought a boat and are now sailing the world. Mark has a wicked sense of humour that I really appreciate. The last we emailed he was wintering in Sicily. Mark has been a great help to me when I was first starting my website. As of late I have not been able to open his website. He is probably busy sailing the Mediterranean too busy to check up on his site. sailmentor.com Chris belongs to the same online business group, Fizzle.co, that I do. He is from Vancouver, BC, Canada and encourages new sailors as well. Chris sails coastal waters and has a ton of ocean experience. I just discovered Viki Moore fom Christ Church, New Zealand lately when she followed me on Twitter. Her site astrolabesailing.com has many varied fantastic articles. They seem to do a lot coastal cruising and are working toward sailing around the world. sofatosailor.com is another site I just discovered when he followed me on Twitter as well. He is from England, UK. Follow him refurbish a 1970s Twin Keel Leisure 17 he has a ton of work to do. It should be very interesting. Carolyn Shearlock from theboatgalley.com has been a favorite of many sailors. There are many practical tips based on years of cruising. Articles and recipes from the galley as well as from the rest of the boat. These are only a hand full of the many wonderful sites that you can enjoy and learn from. The one thing we all have in common is this crazy passion for sailing. If you haven't sailed it's a hard obsession to understand. If you have sailed, well, you know what I'm talkin' 'bout! I can't, for the life of me, remember what my sailboat's name was before I renamed her. Something to do with a conch shell and apparently something that meant absolutely nothing to me. Naming your boat is a very personal thing, like getting a tattoo, don't get someone else to pick it. Giving your sailboat a drinking name like Aquaholic, Drunk Again or Amy's Wine-House in my opinion is just asking to get pulled over by the authorities. Pick a name that reflects you or what your boat means to you. People often get known by their boat names so don't pick one that may be embarrassing to you or your family later. At my club there is Frank from Pivot Point, Dennis from Moonshadow II, Kevin fom deasil or Don & Peggy from Blue Bayou. One clever couple, Alf and Betty, named their sailboat Alfabet. Although not as unique as I had originally thought I named my sailboat Island Time. That name reflected a way to get away from the busy everyday life and slow down to relax. It also represents an attitude. If anyone on the boat asks "what time is it?" the reply is "Island Time". I am fortunate enough to know a local artist, Cy Longman, that lettered and logoed my sailboat with paint freehand. That fit beautifully with the 1977 year. There are many sources on the interweb that show the procedure or ceremony to rename a boat so you don't offend any sea Gods or bring on bad luck. After removing any traces of the old name including pillows, key rings, glasses. Perform the ceremony (or not). This usually involves some sort of sacrifice. I think that rum would likely be a good bet. What is or what will you name your sailboat? Is there a story behind it? Do you have a dream sailboat? I dream about a new sailboat but I haven't found one that fits most of my dreams yet. Sailboats are about compromise. If you have a lot of height in the cabin then your visibility from the cockpit is reduced. A full heavy keel to get you out on a good rippin' day, then it's harder to load and trailer and a shallow beach is off limits. Specifucations are good to compare and see displacement and ballast weights. The draft and the sail and rigging. One of my favorite places to start is at sailboatdata.com There are specs on tons of boats with searches available by boat or builder. Much more information than any picture will tell you. However I love to look at pictures. They give me much more information than a page of specs will. A great site to look up or browse through pictures is sailingtexas.com Head to the Sailboat Photo Gallery to pick your dream make and model listed alphabetically. Also nothing can compare to actually seeing or getting on a boat of course. Walk around the marinas. Ask questions. Most sailors that I know would be very happy to talk about or show you their sailboat. One of the things we love to do when we sail is to crank up the keel and pull right up on shore. We can take a break, go for a walk, have a picnic, light a BBQ or maybe a bonfire. I would also like a little larger boat maybe about 25 ft. for more room and stability. At that size with a swing keel or centerboard we could still load and trailer easier than something larger. The Ericson 25 with a centerboard really appeals to me but I also like an open V Berth with aft head like a Beneteau First 26 or a Jeanneau Tonic 23. It seams the older and heavier I get the harder it is to get in and out of that damn V berth and it feels more claustrophobic too! All of this and it will have to be an older boat that I can afford. These are all things I dream of. As our kids get older and we get closer to retirement it would be wonderful to hit the road and try out new lakes with a more comfortable sailboat. But, for now, I can leave home and get to my yacht club where my Sirius 21 waits at the dock and be sailing within an hour. In a climate where we sail from mid May to early October I sailed 30 different days last year. I can haul my sailboat home with my 12 year old Honda Odyssey if I like. So for now, maybe I already have my dream boat. What is your dream boat? What are your favorite sites to check? Share in the comments to let sailors help sailors. "Thanks again for the wonderful day. Andrew was buzzing about it all night. He won't forget that special day. What great memories. Thanks again so much!! " This was a text that I received from Andrew's mom Trina. My son Gavin and I had taken his friend Andrew for his first sail earlier that hot day in June. On some days when you invite a rookie it can be very windy and scary for them or no wind at all and boring. Especially for young boys. This was not one of those days. It was perfect. We had it all. We didn't start our sail until 2 PM that day. We sailed over 11 nautical miles in about 2 3/4 hours. We had a strong steady wind right off the beam (directly on the side of the boat), so we basically sailed straight down the lake 5 1/2 nautical miles and then came straight back. Andrew was a natural on our sailboat. A 40 degree heel was fun for for the boys and didn't "freak out" Andrew at all (unlike some adults). An unexpected part of the day was when we pulled up astern of Kevin and Frank on Frank's Catalina 27. The boys jokingly threatened to shoot them with Gavin's waterzooka. Frank rose to the challenge immediately and hauled out a 2 gallon pail on a rope, scooped up water from the lake and swung around to meet us. He missed the boys completely but totally soaked me and my iPhone and part of the cabin! We tried to make a run for it but Frank has the faster boat and they caught up to us. Pushing us into the wind I had no room to escape. I knew that Frank had better range with his pail than we did with our waterzooka so I had the boys hold off until after he fired when I could pull in closer. Frank is a fantastic guy, with a great big Lanny McDonald mustahche ( you can't see his teeth), and always a lot of fun to be around. Frank & Kevin could have kept on sailing but they chose to stop and play with a couple of young boys. Fun was fun but we had to quit before one of us old farts got hurt. We planned to drop anchor at some point during our sail for a swim but ugly storm clouds had snuck in over the horizon. This Captain wanted us safe so we headed back to the marina. The boys hid in the dry cabin while I got a bit wetter in the warm rain. Unknown to the boys we ghosted past a fishing boat where a couple of men were huddled under a blue tarp keeping dry. One came out, set down his beer and went to pee over the side of his boat before he saw us. I told him "better put that back, it's too small" We both had a good laugh. None harder than his fishing buddy. The rain had blown over when we got back to the Pelican Yacht club and we finished the day off with a swim and a campfire at Terry Fox Beach and a ice cream cone from The Hot & Frosty for the drive home. "I replied to Trina "You are so welcome. Andrew is a great kid. Lots of sound effects(lasers, guns,rocket ships)on the drive! We all had so much fun today. It was perfect. I'm exhausted and smiling." "Trina texted back "Yes you will all sleep well tonight! Yes, as you can imagine it was quiet here this afternoon without Andy.....Some days he just doesn't stop talking!!! ?? he did say today was "one of the best days of his life!" The Good Old Boat Magazine's really is "The sailing magazine for the rest of us". This magazine focuses on owning and maintaining older affordable fiberglass cruising sailboats. Co-founder Jerry Powlas says " The vast majority of sailboats that are in use today are not new. And the vast majority of sailors today are not contemplating buying a brand new boat. If they're contemplating buying a boat it will be a used boat. A Good Old boat". I'm always so excited the see my edition of Good Old Boat Magazine arrive in the mail. I spend time pouring over the magazine and then keep it around to pick up again and again and again. It is wonderful magazine for the average sailor that does not own a large expensive yacht. I find myself thumbing through older issues and taking renewed interest in articles that have even more importance to me now than when I first received the magazine. The magazine does accept advertising but because it is subscriber supported the magazine is not full of ads like some other publications. The magazine has a few full and part time employees and many freelancers who contribute. Readers also write in about their own refits and modifications. There are many practical articles on maintaining or DIY repairs for your own older boat. There are articles from mainsail reefing to boarding ladders to anchor reviews and tips. There are articles on featured sailboats, articles comparing that featured sailboat to similar boats and reviews on sailboats. There is good practical advice on seamanship skills for the beginner right up to the salty old dogs. The magazine, founded by Karen Larson and Jerry Powlas, is published bi-monthly (6 times a year) and is available in paper or digital editions. There is a newsletter and a podcast. They have a very extensive website with classified ads. They even post a list of other sites that have classifieds. The magazine has changed from what they first envisioned because they listen to their readers and give them the magazine their readers wanted. As they say "we're trying to offer a service; this is not a competitive adventure." You take a friend or two for a sail on beautiful day. Maybe it's your spouse and child. Every thing is wonderful until the unthinkable happens. And that is the problem, we don't think about what could happen if you the captain is incapacitated and no one else knows how to handle your boat. You could fall overboard and watch your boat sail away without you because nobody on board knows ow to stop it. I suggest making a list or even a binder and show any passengers where you keep it. Go over this list with new passengers and make sure they can find it when needed. Make your list in point form but add details or explanations. They might not remember what you showed them a few hours ago. I sail on smaller inland lakes so my emergency list may be different from yours. Make your list to suit your sailing. - This is really important, breathe deeply and try to keep from crapping yourself. -GPS co-ordinates or land marks. Talk about the different land marks as you approach or sail by them. Drop the anchor, show them how to deploy the anchor. It may keep you off the the rocks and will keep you pointed into the wind. Boarding ladder- be sure they know how to lower it if it is permanent or where it is stowed if not. Lower outboard and start the engine, let them try this and get used to the tiller or wheel. If the water is rough or stormy show them how crank up the swing keel and beach the boat. What will you put on your list? What did I miss on mine? Leave a comment to share! Darlene Hildebrand, Steve’s partner in crime, on their Cloud, a Niagara 31. Darlene, who has been incredibly supportive to Steve, developed a love for sailing in 2005 when she met Steve. Steve Van Vlaenderen is an amazing and inspiring man who struggles with Parkinson's Disease as did my own father. He is convinced that sailing is helping control and even slow down the progression of Parkinson's disease. It has been four and a half year since my neurologist strongly suggested that I should consider giving up sailing , advising me that balance and mobility may become problematic. I decided to challenge that advice and decided to sail on regardless of the fact that I had Parkinson’s disease. This year will be my sixth season sailing. On July 12th 2015 my partner Darlene and I set sail from Gimli Harbor for a twenty three day sailing vacation north on Lake Winnipeg, our second trip north this year. Our destination was Princess Harbour and Matheson Island. It was a challenging trip to say the least. The condition of the lake changed constantly on us. For eight days out of the first thirteen days we experienced severe thunderstorms, as many as three times per day, with winds at times registering 45 knots. I quickly learned that respecting Lake Winnipeg was as much about understanding the natural elements we were facing – wind and waves – as it was about the unexpected effects that those natural elements can have on both sailboat and crew. I also learned patience - tied to a dock, unable to sail anywhere on those days we were becalmed by no wind and 34c plus temperatures ! Shortly after our return from our trip, I was asked : were we ever scared ? Thinking about it for moment, I remembered a quote from Louisa May Alcott I once read : ‘’I am not afraid of storms for I am learning how to sail my ship’’ . Sailing for the past six years has been a life altering experience for me. I quickly came to realize how similar the required knowledge of sailing is to dealing with life issues. Sailing requires many things . It requires tactical skills. Team work is critically important. Good communication and clarity is paramount. You must know how to develop long term strategies when laying out your course in order to arrive at your destination on time and safely. Sailing requires flexibility when things like wind shifts or unexpected storms completely change your plan. Over the past number of years sailing has taught me that It is very important to have a well prepared plan in both sailing and in life. As the Captain I am tasked with making multiple decisions : development of a sail plan, reviewing the weather conditions and forecast, route options, when to sail and when to stay at a safe harbour, provisioning , the condition of the equipment to mention only a few. I have to make sure that I don’t lose focus in critical situations. I need to spend less time dwelling on unimportant issues. Outside influences beyond our control will often force a course correction, both in sailing and in life. It has become very important for me to recognize subtle changes and revise my strategy quickly when it comes to dealing with my own health issues. The motor symptoms of Parkinson’s disease –tremors, muscle stiffness, slowness of movement , balance problems, to name a few, are not the only symptoms I have to contend with day to day. Depression and anxiety are also common symptoms of Parkinson’s disease, and I’ve experienced both . I’ve actually found these “non -motor symptoms” to be more challenging and disabling than the motor changes that I experience. But what has become obvious to me is that when I’m sailing I don’t experience these symptoms. No depression or anxiety. I have gained a greater height of awareness of the people and things’ around me. To use a sailing metaphor: I’m constantly adjusting my sails in order to accomplish what I want to accomplish in a given day. Sailing has been for me a spectacular experience in life and has taught me a lot. . Sailing has taught me that I am capable of more than I, and my doctor, thought I was . I’ve learned to slow down and enjoy the moment. Because of sailing, my confidence about the future has grown and I know I’m capable of “sailing on” with Parkinson’s disease. I have always wanted to sail. It was a life time dream since I was a child. However, competing obligations such as family and business career always came first forcing me to postpone my dream of one day having my own sailboat. Someday attitude turns out to be fifty years. At sixty I finally (five years ago) purchased ‘Cloud’, a thirty one foot Niagra. Taking sailing lessons and navigation courses I began to experience what it was truly like sailing. It was a wonderful experience that taught me a lot about my life. That first year of sailing was overshadowed by learning that I had Parkinson’s. My outlook on life immediately changed. As I listened to the prognoses I began to get visions about the end of my life, sitting in a care home being feed with a spoon, or being put into some undignified position while having to go to the bathroom with a seemingly uncaring health worker just doing his or her job. My dreams and aspirations became shattered. The purpose in my life disappeared in one single verdict from the Neurologist. No longer was I in control of my life; dependent on medications for the rest of my life to address the symptoms; in which, according to the Doctor will loose its effectiveness over time requiring an ever increase in dosage to relieve the symptoms. The words; “there is no cure for Parkinson’s Disease,” still resonates in my mind to this day. Accepting the Doctors recommendations I was immediately put on a medication program to slow down the progression of the Parkinson’s disease. Without question I took my meds every day for the next two years. Despite the treatment, I was still experiencing deterioration in mobility and activities. The hardest thing was copping with the continuous feelings of sadness, loss of interest, and pleasure’s. Negative thinking became the norm in my day, yielding to a feeling of nervousness and worried thoughts which exacerbated my physical distress. My weight ballooned to 258lbs, my waist expanded to 40 inches from 34 inches. My self- esteem bottomed. I was slowly being stripped of any hope to deal with the disorder. I had to do something, anything was better than what I was going through. I was at my lowest point ever. Somehow I instinctively realized I held the power to create a huge change in my life but I didn’t know what I didn’t know, I didn’t quite know how to make the change. I started by defining small goals with measurable achievements. The first priority was of course to lose the weight, 20lbs by Christmas. A commitment to the gym at least three times per week. I started the gym that same day. I had to work on my self-esteem issues. Working on feeling good about myself, I felt was an excellent starting point. Three weeks into my workout routine, I was approached by a trainer who had observed me working out diligently, and complemented my efforts. Continuing with his conversation, gave me advice that would forever turn my life around. Proper nutrition, eating clean is the way to weight loss, he would say. Losing weight is 90% nutrition and 10% exercise. Taking his advice I started an eat clean diet that very next day. Noticeable changes became evident within the first thirty days. I not only achieved my goal of losing 20 lbs by Christmas but exceeded my goal by losing 40lbs in less than 3 months. Losing the weight had such a profound, life altering effect on me that went beyond the sense of accomplishments. My time in the gym coupled with proper nutrition provided me with incredible health benefits. It forced me to learn about my own body, how it works, and how to manage my Parkinson’s disease. It gave me mental clarity and focus, physical strength and spirit. It taught me discipline and commitment. I understood and accepted the reality of living with Parkinson’s disease; adapting the motto ‘Change what you can, manage what you can’t’. For the first time in over two years I felt that I had regained some semblance of control of my own life. My doctor suggested that I give up sailing due to possible balance problems inherent with having Parkinson’s. I felt my dream was shattered. Although I was suffering from depression I refused to surrender my dream. Instead I continued to sail, logging an average of 800 nautical miles each summer. Sailing requires a lot of discipline and knowledge. I correlated this experience to taking ownership and control of my own health. While sailing I don’t seem to experience the symptoms of Parkinson’s, I appear to be relieved of any outside stresses of normal life. I have been able to stay lean, reduced my body fat to less than 8%, reduced my stress level, eliminated anxiety attacks, reduced cholesterol levels, reduced internal inflammation, I sleep better, acid reflux disappeared, arthritic pain is almost entirely eliminated. I even stopped snoring. I have mental focus, clarity and sharpness like I never had before. I am more productive and creative than ever. It has taught me to learn more about my own body, how it works, how exercise, nutrition and the mind can work in harmony; for me, this was my medicine, I listened to what my body was telling me, what I needed and took appropriate actions. My Parkinson’s improved while sailing. I plan to continue sailing for years to come. I haven’t cured my Parkinson’s Disease, however most important and most incredible as it may seem, I’ve slowed down the progression of my Parkinson’s disease. If you don't like backing up a boat trailer or it makes you nervous, don't worry, you're not alone. There always seems to be an audience when you're backing up a trailer especially at the boat launch when everyone is anxious to get out on the lake. If you can, go practice in an open field or an empty parking lot. Remember that if you find this difficult, don't panic or feel bad, absolutely nobody gets it right the first time. If possible it is best to have help. Have someone spot for you. Remember, safety has to come first, never have them go behind the trailer and stop backing up if they do. I always think "what if ?". What if your spotter tripped or what if you hit the gas instead of the brake. Always keep your spotter in sight. Be sure that you can see them in your mirrors. Agree on hand signals before you start. When showing how close the trailer or vehicle is getting to it's mark. I like to have my spotter stand facingthe mirror showing the distance with his/her hands apart (like showing how big a fish you caught), slowly closing their hands as the trailer approaches its mark. I also like to use the term driver or passenger side for directions instead of left or right. This eliminates confusion and arguments. Take a few minutes to walk the area where you are backing to. Try to get an image in your head of the layout. Notice any dangerous spots or obstacles that you definitely want to avoid like a post or drop off. Pick a point of reference beside where you are heading to. The dock is good one it is usually square with boat launch. Throw down some blocking or a life jacket or something noticeable if you need to. Now lets back up that boat trailer. Have you ever pushed a wheal barrow? To get it to go left your handles have to go to the right. Your trailer is the same. To get your trailer to go one direction your ball hitch or rear of your vehicle has to go the other. This means that as you backup to get your trailer to go to the drivers side you turn your steering wheel to the passenger side. WHAT! How are you going to keep this straight when you're feeling the pressure of a line up at the boat launch, your 6 year old has to pee and you can hear your teenager rolling her eyes? Imagine the shape of your boat on your steering wheel. The back of boat is at the bottom and the front of boat is at the top, put your hand at the back of trailer (bottom of steering wheel), now just steer your boat. To make the trailer go left, move the bottom of the steering wheel left, to make the trailer go right move the bottom of the steering wheel right. 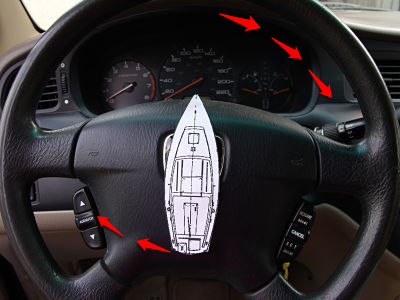 This also makes your steering corrections smaller than having your hands at the top of the steering wheel. I talked to numerous professional drivers and they all said that the biggest mistake beginners make is over steering and backing up too fast. Go slow, make small corrections. If you do turn too sharp just pull ahead a bit to straighten out and start backing up again. Also remember that the longer the trailer is the easier it is to back up. So when you're having a hard time backing up a small boat trailer, don't feel bad, it just takes practice. The longer your trailer the longer it takes for trailer to catch up to vehicle corrections. It is easier to back up a 50 foot semi. If I am backing up my boat at an angle I will look over my shoulder out the drivers window until I am able to get my boat lined up to back up straight. This is why, if you have to back your boat at any angle, you should pull up in the direction that will let you back your boat towards the divers side so you are not backing up blind. See illustration for the swerve maneuver to help you align your boat. The red arrows indicate the front wheels direction as well as the back of truck and trailer direction. Drive along the right side of the road but before you get even to your back in spot start to swerve toward it. As you pass your spot start to pull away again. As the back of your boat lines up stop. Start backing up. Turn the bottom of your steering wheel left so that your trailer will pivot left. As you get close to aligning your trailer, now is the time to counter steer to straighten out, not when it is lined up. Don't forget to keep an eye on the front of your vehicle when you're watching behind you. You don't want the front to swing over and hit something while you're watching behind you. Ease off on counter steering and straighten out. so be aware of this to get your alignment. Line up straight. If you go too far simply pull ahead a bit to straighten out. When you can start backing straight back use your side mirrors. To back up straight keep the same amount of trailer visible in both left and right mirrors. Remember, take it easy, hand on the bottom of your steering wheel and make small corrections. Keep an eye on your spotter. Launch that boat, park your truck and trailer and go sailing! Remember that with practice this will just get easier.